What is the world coming to?!?!?! 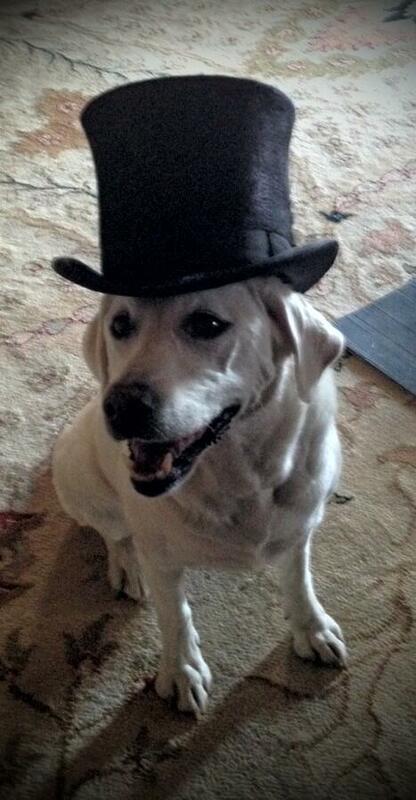 Allen Leech has started a Twitter War with our favorite Downton Abbey dog, Isis!!! As every Downtonian knows, Allen Leech plays the former chauffeur, now family member and estate manager, Tom Branson, who was widowed last season when the lovely Lady Sybil died just after childbirth. And Isis is the beloved Labrador Retriever that has free run of Downton Abbey as the Crawley family dog. I think Allen Leech has set up poor Isis. Tom Branson hates formal wear so why is he now claiming that it is his top hat? How did a dog with no opposable thumbs get a hat on its head? And how in the world is sweet Isis supposed to respond to his Twitter attack if she can’t type on her iPhone? Is this Tom’s revenge for Lord G asking him to walk Isis while the family was in Scotland at the end of last season? Or maybe it is really Lord G’s top hat and Isis is mad at Lord G for calling her lazy? These are the questions I want answer!!!! I need satisfaction that our beloved Isis will see justice in this maligning of her character. Oh the injustice of it all!!! !